The success of an energy procurement program often hinges on determining the appropriate fixed price paid for energy. This is a major challenge in designing fixed-price, long-term contracts. Historically, the most widely used mechanisms to set a price for energy have been auctions or administrative price setting. 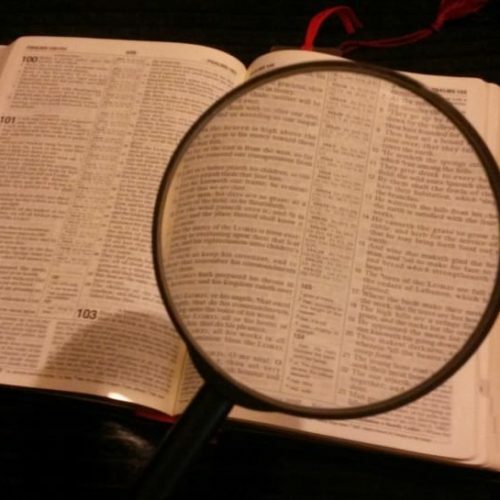 However, both mechanisms have significant flaws. Feed-In Tariffs (FITS) with Market Responsive Pricing (MRP), on the other hand, have been proven to unleash clean local energy in a cost-effective manner. 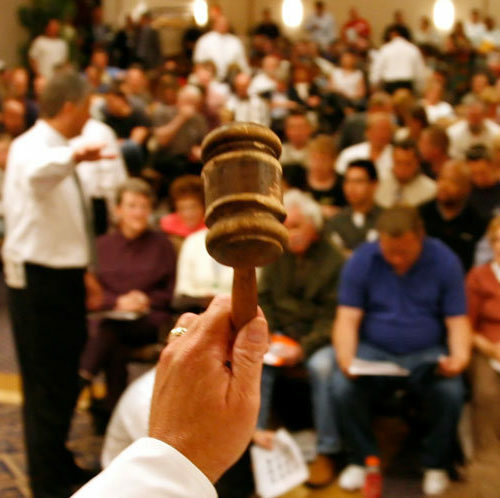 The high cost for bid preparation and qualification for parties seeking to sell energy, combined with very low certainty of success, discourages participation in auctions. In addition, developing a request for offers and managing the responses is a substantial burden for the purchasing agency. These factors create disproportionately high transaction costs when seeking to attract development of commercial-scale projects. Another problem with the auction approach is that it does not send the market clear and consistent pricing signals that assist developers in determining whether a potential project is financially viable and worth pursuing. Administratively set fixed prices are optimal only if the price matches actual market prices. If the price is set too low, there is insufficient participation in the program. If the price is set too high, then a “gold rush” may ensue and the buyer will overpay for energy. Administrative determination of appropriate pricing requires significant effort, and even the best effort cannot perfectly account for all market factors. Market Responsive Pricing (MRP) is an effective and easy-to-implement mechanism in a Feed-In Tariff (FIT) that allows the price offered to automatically adjust as the market responds to the program. The essential feature of MRP is to adjust the initial FIT prices offered over time based on the market uptake. With high interest in a FIT, the offered price adjusts downward for future Price Purchase Agreements (PPAs). 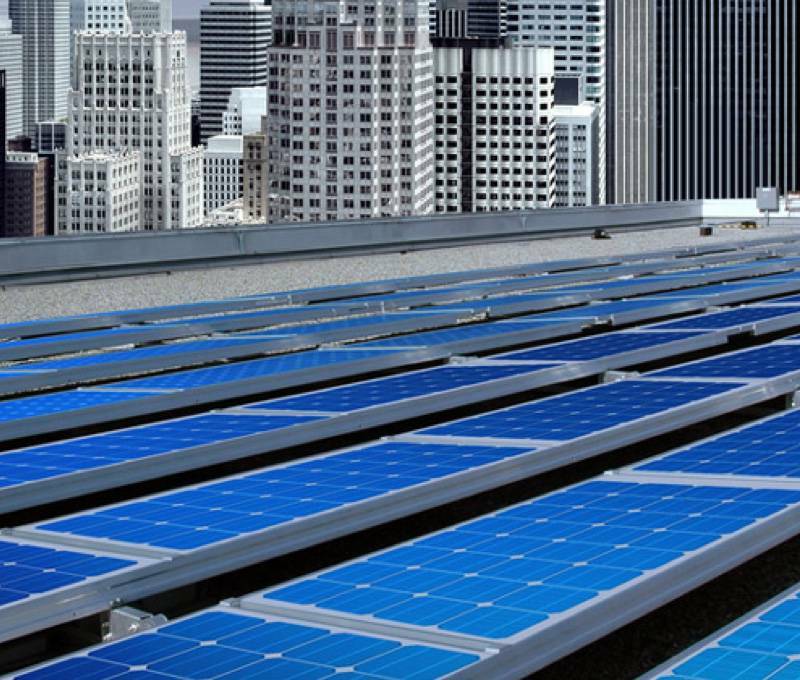 With low market interest in a FIT, the offered price adjusts upward for future PPAs. MRP has emerged as a best practice for accurate price discovery, through ongoing polling of the market, over the duration of an energy procurement program. When purchasing electricity from local renewable generators under a FIT, the load-serving entity (LSE) should use the MRP approach to adjust the price for successive long-term PPA offers. By adjusting the contract price offered to developers as the market responds, the LSE can efficiently meet its procurement target without administrative recalculation to estimate the correct price. Pricing with MRP is fully transparent, resulting in market efficiency and a drive toward the lowest viable prices, while also limiting risky speculation through being forced to place bids at prices that are unreasonably low, as happens with auction programs. Competition between sellers for the available contracts maintains the lowest viable pricing while reducing project failure risk when compared to an auction mechanism, as generators are not trying to win a bid, and are far less likely to contract at a price that is too low for the project to be built. MRP offers visibility and control over program costs. Procurement planning limits the amount of energy/capacity contracted at the offered price, so policymakers are able to control the rate of uptake, the maximum price paid for energy, and total expenditures for purchased energy. 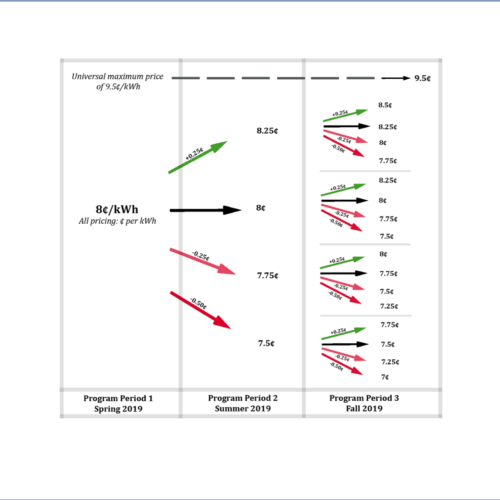 To implement MRP, program designers must first determine tranches for assessing market response, the magnitude of price adjustments (up and down), and the length of the waiting periods to gauge market response before the price is adjusted. Example: A FIT using MRP will allow the first 7.5 MW of capacity to contract at a starting fixed price. If the first 7.5 MW tranche fills quickly with projects, then the price paid for the following 7.5 MW tranche is reduced by a predetermined adjustment. If, on the other hand, the first 7.5 MW of available capacity is not procured within the planned timeframe, then the fixed price adjusts upward by a predetermined increment after a set period of time for the subsequent tranche. The MRP mechanism continues to apply through the lifetime of the FIT, which means that only the initial fixed price is determined in another manner. The use of MRP limits the risk associated with a starting price that might not be optimal, and deliberations over the starting price can be minimized — further reducing administrative burden. The LSE should be aware that a small program will have proportionately fewer participants, which means fewer data points and limited opportunity for market response. A smaller program also needs time to garner market interest and establish a record of successful contracting and development. Pricing adjustments should be made quarterly when new FIT program capacity is allocated. Adjustments of ±0.25¢ are large enough to ensure program pricing is market responsive, while not so large that wild swings in pricing will create an unstable and ineffective program. However, this MRP design includes a price decrease of 0.5¢ if the LSE receives valid applications totaling more than 11.25 MW for any given tranche, which is 150% of the desired 7.5 MW quarterly capacity. This will minimize risk for the LSE by ensuring a larger price drop if the market shows very strong ability to deliver local renewable energy capacity at a set price. If valid applications exceeding 11.25 MW (150% of 7.5 MW, the desired quarterly capacity) have been reserved as of 30 days prior to the next scheduled quarterly procurement, then there is a downward price adjustment of 0.5¢. If valid applications totaling between 7.5 MW and 11.25 MW (100-150% of desired quarterly capacity) have been reserved as of 30 days prior to the next scheduled quarterly procurement, then there is a downward price adjustment of 0.25¢. If valid applications totaling between 4.5 MW and 7.5 MW (between 60% and 100% of desired quarterly capacity) have been reserved as of 30 days prior to the next scheduled quarterly procurement, no price adjustment is made. 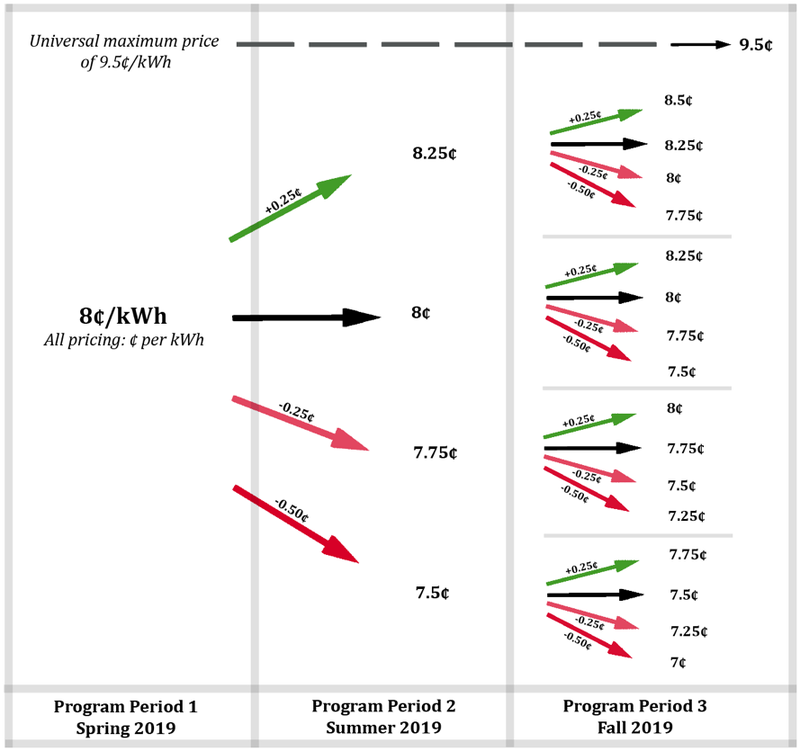 If valid applications totaling less than 4.5 MW (less than 60% of desired quarterly capacity) have been reserved as of 30 days prior to the next scheduled quarterly procurement, then there is an upward price adjustment of 0.25¢. Quarterly pricing adjustments allow adequate time for potential providers to respond. The Clean Coalition’s recommended pricing adjustments are proportional to the level of market response, while providing increments sufficient to change market response in the next allocation. The LSE should create a universal maximum price, which is the maximum price the LSE will pay for energy through its FIT program. A clearly defined universal maximum price will send a signal to the market about the LSE’s limit, and it will enable the LSE to establish an upper limit for its FIT program budget. The MRP structure can be applied to the Dispatchability Adder. 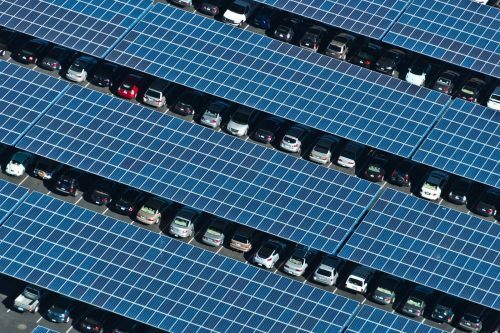 Such a mechanism can be designed to adjust the Dispatchability Adder (¢/kWh), either up or down, based on whether the market is able to deliver dispatchable renewable energy at the offered price. Through offering capacity in predictable, quarterly allocations, the LSE will drive an efficient dispatchability adder, sustained by MRP in order to reduce dispatchable energy pricing over time. For the City of San Diego, the Clean Coalition designed a FIT with streamlined interconnection that includes a Dispatchability Adder and MRP. The price paid under the FIT for both solar and storage adjusts based on market response, ensuring that the LSE pays the optimal price for clean local energy. MRP is critical to successful procurement under the San Diego FIT.